What Do I Do After a Forklift Accident? Whether you are an employee, contractor, vendor, or visitor, if you are involved in an accident while on a construction site, you should know how to get the help afterwards. Forklift accidents are one of the most devastating ways that workers and others can suffer injuries or even lose their lives on a construction site. In the immediate aftermath of a forklift accident, the most important thing to do is make sure everyone who was involved in the incident receives the medical attention they need. You also need to report the incident to your employer. Keep a copy of this report for your records. After that, you need to speak with an experienced construction accident attorney as soon as possible. Keep in mind that your employer, their lawyers and insurer may try to convince you to avoid pursuing an injury claim, even if that is the best option for you and your family. What is most important to your employer and their representatives is avoiding taking any responsibility for the forklift accident or your injuries and instead gathering evidence to put the blame for the incident squarely on you. That way your employer can avoid taking the financial hit of having to provide you and your family with the compensation you need for your hospital bills, loss of income, and living expenses. In some cases, your employer will take drastic measures to deny your claim, possibly even by firing you. Forklift injuries are more common in certain industries than others, such as the retail, manufacturing, mining, transportation, wholesale, and construction industries. Who Is at Fault for a Construction Accident? There are often several different groups of workers and others on a construction site at the same time. First, there are the construction workers, administrators, engineers, architects, and executives who work for the construction company. Second, there are sometimes contractors and subcontractors who are brought in to handle construction projects onsite. Finally, there are vendors and visitors who are onsite to deliver or pickup equipment, or to visit someone onsite. Any member of these groups could play a role in a forklift accident. In addition, equipment manufacturers, who are often not on construction sites, could also be responsible for a forklift accident involving mechanical failure if a design flaw or manufacturing error led to the incident. Should I Pursue a Personal Injury Claim or File a Workers’ Compensation Claim? 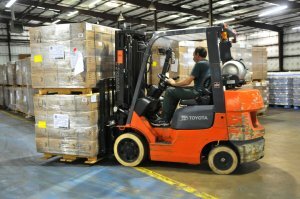 Following a forklift accident, a victim or their survivors may have the option of pursuing a workers’ compensation claim, third party claim, or a personal injury claim. Speaking to an attorney can help victims and their families understand what options are available to them according to who is at fault for their accident and the laws of their state. In some cases, pursuing a workers’ comp claim may be the only option or the best option for a victim. In other cases, pursuing a third party claim against a vendor, contractor, or subcontractor who is responsible for their forklift accident may be the best option for victims and their families. What If My Loved One Was Killed in a Forklift Accident? Families who have lost a loved one in a forklift accident have options available to secure the help they need. Survivors of forklift accident victims can pursue compensation for funeral expenses, loss of income (if the victim was a breadwinner for the family), and any medical bills the victim had from the incident prior to losing his or her life. Following a construction accident, construction workers and their families should discuss their situation with an experienced personal injury and workers’ compensation lawyer. The construction company, their legal team, and their insurer will be busy gathering evidence to ensure they avoid taking responsibility for the accident and your injuries from day one. You and your family need legal representation that is fighting to ensure you get the help you need to pay for hospital bills, ongoing medical expenses, loss of income, and living expenses. An experienced construction accident attorney can successfully guide you through the legal process of securing a workers’ comp claim or third-party claim. In addition, even if you do not plan on filing a workers’ comp or third-party claim, many qualified and experienced lawyers will talk to you about your situation for free, including advising you on the best options for moving forward.